Sit upright on a bench with your back firmly against the pad. Keep your core tight and feet anchored to the floor. 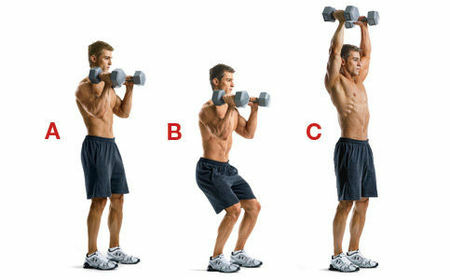 Bring the dumbbells up to shoulder height, raise them out to the side, and powerfully press overhead. Keep the dumbbells separate at the top of the movement. Slowly lower until your triceps are slightly below parallel. Hold for .5s at the bottom and repeat. Make sure to keep your shoulders back at all times. Tip: Do it standing to jack up the difficulty and increase core engagement. Place a dumbbell in between your feet and stand with your legs slightly wider than shoulder width. This is starting position. Tighten your core, explode upwards, and powerfully pull the weight up and overhead. Keep your back flat and maintain strong posture. Hold 1s at the top and slowly return down to start. Immediately repeat. Tip: Pause at the bottom for 1s to avoid using momentum. Stand tall with two dumbbells over your shoulders. Hold them with a neutral grip (palms facing in). 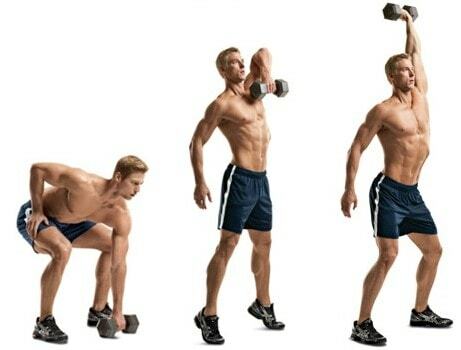 Dip down slightly, explode up, and powerfully press the dumbbells directly overhead. 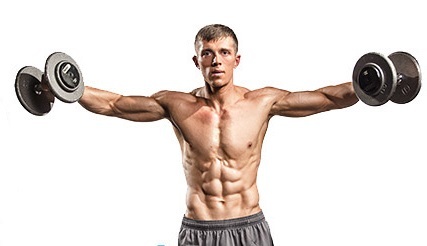 Hold for 1s at the top and lower the weights back down to your shoulders. Keep your core tight throughout. Tip: Do it on one leg or a BOSU ball to increase core stability. Grab two ropes with a firm grip and squat down slightly. Sit back into your hips and keep your abs tight. Vigorously pull the rope up with either arm and then throw it down. 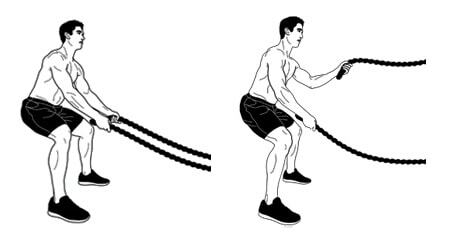 Continue to alternate up-and-down and build up speed as your arms get into a rhythm — the ropes should look like two waves. Repeat for 30 seconds or until your arms give out. Tip: You can also do battle ropes in sync and raise/lower both arms at the same time. It sort of looks like a Hulk-smash.